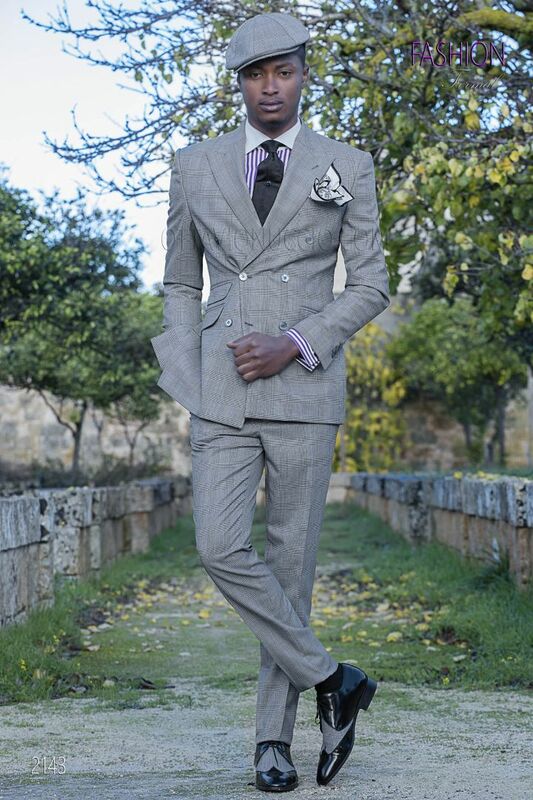 Grey double-breasted men suit in wool blend prince of wales fabric. Peak lapel, 2 vents at back and ON signature corozo ... Grey double-breasted men suit in wool blend prince of wales fabric. Peak lapel, 2 vents at back and ON signature corozo buttons. Classic shirt made from purple striped cotton with white contrast collar. Reinforced exposed placket with signature naca... Classic shirt made from purple striped cotton with white contrast collar. Reinforced exposed placket with signature nacar buttons. Double cuffs for cufflinks. 8.5cm tie made from 100% Black in pure cashmere silk. Handmade. Flat cap made from pure wool fabric with Prince of Wales design.